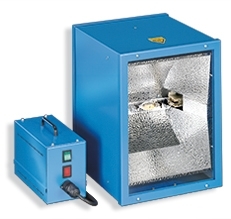 BEST-UV-SPOTS – a series of high intensity UV-units, especially suitable for exposing of larger areas. BEST-UVA-Spotsachieve very high uniformity and high intensity throughout the irradiation field. A seperate power supply unit controls the lamp. For multiple lamp systems the power supply units can be integrated into a single switch cabinet. BEST-UVA-SPOT-400/T, -1000 and -2000 cure all BEST-PL and BEST-KL-adhesives and are suitable for bonding of glass, synthetic materials, metals and for casting of electrical or electronic components.